The infrastructure is based on the location of the fruit and vegetable centre in a strategic position. With reference to the different production sites it means that this location is the centre of sales, marketing and export of all products such as lettuce, fresh and early vegetables. As a support for the daily study market, Hortalizas Ortiz works with a trade delegation in Barcelona (Mercabarna), Spain. 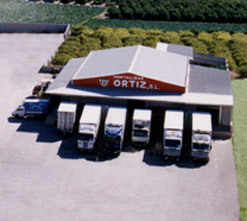 Hortalizas Ortiz has an own impressive structure of logistic, which manages the transport and the distribution of the products. Therewith it is secured that the product arrives as soon as possible and under proper qualitative conditions from its point of origin to the point of sale.